The UCSB Jazz Ensemble welcomes guest artist Chris Merz for our final concert of this season. About this concert, Jazz Ensembel director Jon Nathan wrote: It is a rare pleasure indeed to present a concert which features almost entirely music by composers with whom I am personally aquainted. Chris¹s and my friendship goes back to our college days in Massachusetts, and it is indeed exciting to interact with him again at this completely different level. It is an honor to be able to present UCSB student works, such as Sameer¹s Circus and Tom¹s Second Wind, but also former student Bill Kennerly¹s arrangement of How Deep is the Ocean. Both Glenn Garret and Matt Harris are Los Angeles musicians who I am happy to call professional friends, and I am proud to present their music here. Many thanks to the band for their hard work and dedication this year, and we wish our graduating bandmates all the best in their futures. We are glad to share this performance with you and hope to see you again in the near future. Chris Merz has toured four continents with members of the Brubeck family, including Dave Brubeck. he has performed with many of the giants of South African jazz, including Barney Rachabane, Winston Mankunku Ngosi, Hugh Masekela, and Joseph Shabalala (Ladysmith Black Mambazo). 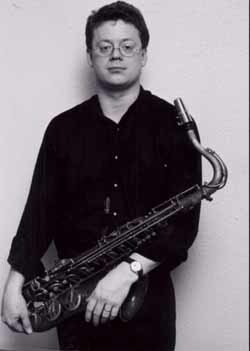 He has played lead alto saxophone with several east coast big bands, including the Cecil Bridgewater Big Band. His own projects include Equilateral and the X-tet, a 12-piece big band. He has several compact discs to his credit, including his newest effort, Mystery is My Story. About that disc, Dave Brubeck wrote, ³I am very pleased with this wonderful band. Naturally I would admire a group like yours that, to me, is a grand extension of what we were doing...when we were the ³new thing². He has received commissions from university and high school jazz ensembles throughout the country. His compositions and arrangements are published by UNC Jazz Press. He currently serves as Assistant Professor of Jazz Studies at the University of Northern Iowa, which recently received a Grammy nomination for Jazz Ensemble I Œs cd, Just Us. He has also taught at the University of Wyoming, the University of Massachusetts, and the University of Natal in Durban, South Africa.